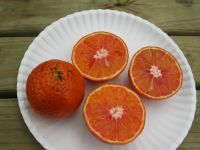 Bill Chapman of League City, Texas, brought Moro Blood Orange pollen to a monoembyronic umatilla flower which is a Satsuma x ruby orange cross. From this flower he grew a fruit, collected the seeds, and grafted a seedling bud to a Poncirus Trifoliata seedling. He gave me a budded seedling around July, 1989, and he asked that I grow the grafted seedling to see what kind of fruit it would produce. After several years I was able to get the grafted seedling to fruit. Lewis Walden tasted the fruit, and he named the cross Raspberry Tangor (RT) since the fruit was red inside and had a slight raspberry favor. Many buds have been taken from the original tree that I have, and the variety has been tested in several locations. The tree produces a fruit, shaped like its mother the Umatilla that ripens in February or March, and it, too, has monoembyronic seeds. Chris Kneupper and JoAnn Trial did an acid and sugar test on the fruit and calculated an acid to sugar ratio. They found that the RT has about 11.6% sugar, but it never loses its acidity of about 2.2% citric acid. When you ratio the sugar to acid, you get about 5.2, and this falls in the category that one finds in mild lemons and grapefruits. Free citrus tasting and open house. CALIFORNIA RARE FRUIT GROWERS INC. Blend eggs, butter, sugar, and beat until creamy. Stir in milk and vanilla. Mix soda into flour and add to the mixture. Stir in mashed bananas, Kumquats, and nuts if desired. Bake 45 min. at 325 degrees in greased pan. Add powdered sugar glaze if desired. Optional: While hot, drip a few teaspoons of orange juice on top. This makes it moist. - In a bowl, beat eggs, sugar, and oil or butter. Fold in dry ingredients and mix well. - Add chopped Kumquats, nuts and pineapple. - Pour into greased and floured tube pan. - Bake 1 hour and 15 minutes in a 350 degree oven. - Cool and remove from pan. Make a confectionate sugar glaze with chopped Kumquats. Add to top of cake or as a sauce on cake slices. Blend all in a food blender and freeze in an ice cream maker. Many people do not realize that it is illegal to bring citrus trees into Texas from any state or country outside Texas. It is even illegal to bring fresh citrus fruit into Texas from Florida. The purpose of this law is to prevent the spread of diseases. Florida has the dreaded citrus canker, and re-greening disease that spread all over Florida because of recent hurricanes. To prevent the spread of these diseases into Texas, Texas passed a law which requires all Texas citrus to be labeled “Produced in Texas” and to have the license number of the originating nursery. I can understand the purpose of having a license number on a tree, but adding “Produced in Texas” to a label does not seem to have a purpose. If someone wants to break the law, they can add the label “Produced in Texas” on trees from anywhere. Also, a nursery license number should be searchable on the web so that the consumer can research the history concerning who produced the tree. This is important because many nurseries are only resellers of trees. At the present time, you can not search the web for information about the originating nursery. When the consumer purchases a tree from Wal-Mart, Lowe’s, Home Depot, or a large nursery, they have no idea what rootstock was used or who produced the tree since the producing nursery is not required to be on the label, and the number is only known by the Texas Dept of Agriculture. A requirement that all bud wood be purchased from the Weslaco Citrus Center is slowly going into effect. The wood is certified exocortis, cachexia, and xyloporosis free. The Citrus Center realizes that it does not have all the varieties that many citrus collectors and “citroholics” desire, and they have agreed to import some varieties which they don’t have from the California germ-plasm bank. Unfortunately, California recently found tristeza in their “clean” trees, so Texas has temporarily suspended importing buds from the California germ-plasm bank until they completely check and certify their trees free of tristeza.